The first definite reference to Bromley is in the charter of 862. Named Bromleag, it is believed to mean the clearing where the broom bushes grow. The town�s significance was the result of its early link with the Bishops of Rochester who established a residence in the area at a early date. In 1205, it was the Bishop who was responsible for the establishing of a weekly market in the town. This continues to the present day. The market, together with its position on the main Rye (later Hastings) road made Bromley a natural centre for the local area and it soon became the most important settlement in the district. 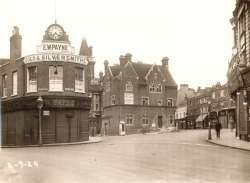 Bromley retained this leading position into the nineteenth century including a brief period as a fashionable spa town and health centre until two events temporarily threatened its dominance. In 1844 diocesan boundary changes caused the Bishop of Rochester to move away and the Palace to be sold into private hands, while the comparatively late arrival of the railway in 1858 made other towns such as Croydon and Lewisham a more attractive prospect for development. Once the railway was running Bromley again became a popular location. 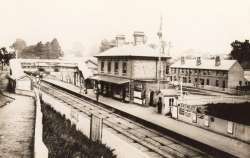 New Bromley to the north of the town began in the 1860s and was further enhanced by the building of a second railway line in 1878. Initially small artisan style dwellings; larger houses followed along the London Road in an area known as Bromley Park. 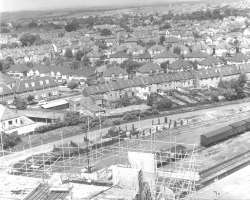 By the outbreak of the First World War, development in central Bromley was fairly complete, subsequent development being restricted to infill and the replacement of a number of larger houses and industrial buildings with smaller modern houses and flats. In the last twenty years much of the town centre has been rebuilt to accommodate the large Glades shopping centre, resulting in the loss of much town centre housing while the Bishops Palace, initially converted in the 1930’s into a new home for Stockwell teacher training college, is now the core of Bromley Civic Centre.